Join WILDCOAST for National Bike Month 2016!! What is the best way to get to the beach, use your nature based recreation areas, and enjoy your coastal trail systems? By bike of course! In celebration of National Bike Month 2016, WILDCOAST will be leading the events listed below. As part of our US-Mexico Border program, we will be promoting the use of trail systems in the Tijuana and Otay River Watersheds, connectivity of open space areas through bike planning, and coastal access for biking. 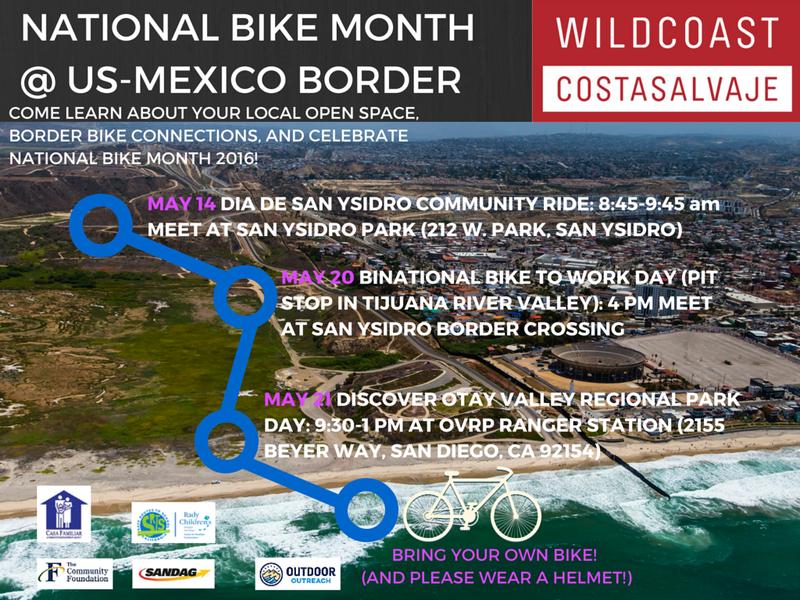 Join us on Saturday May 14 in San Ysidro, Friday May 20 for a binational Bike to Work Day, and Saturday May 21 for our annual Discover Otay Valley Regional Park Day!! Be sure to wear a helmet!! Also, check out the cool article below on our efforts in the border region to promote biking and connectivity of open space systems. For more information contact John Holder, Border Coordinator at 619 417 8736. « What do mangroves, rock and roll and big wave surfers have in common?